Fall is one of my favorite times of the year. Not only does the unbearable heat of our Southern summers come to an end, but the trees begin to turn vibrant colors, and apples, pumpkins and scarecrows abound. I also love that Fall is full of fun holidays, sweet treats, and delicious foods; but the reason I love Fall most of all? Because of all the fabulous foods I get to bake! Speaking of candy and baking, I have 2 pieces of sweet news (one has to do with an awesome sweepstakes so be sure you read through the whole post!) and an awesome recipe to share with you today! First of all, piece of news number one! Perhaps you’ve already seen them at your local Walmart, but M&M’s® has come out with a delicious new flavor: M&M’s® Pecan Pie! 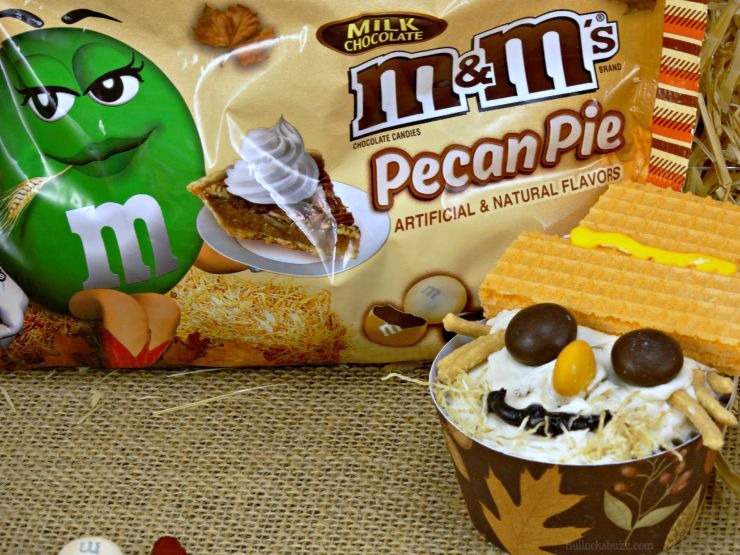 Now I know what you’re thinking – most likely the same thing my husband did – M&M’s® flavored like pecan pie? YES! And I’m here to tell you these new M&M’s® Pecan Pie are worth trying – especially if you love milk chocolate and pecan pie! Heck, all you have to do is open the bag and smell and your mouth will start watering! Get ready for some more mouth-watering deliciousness! 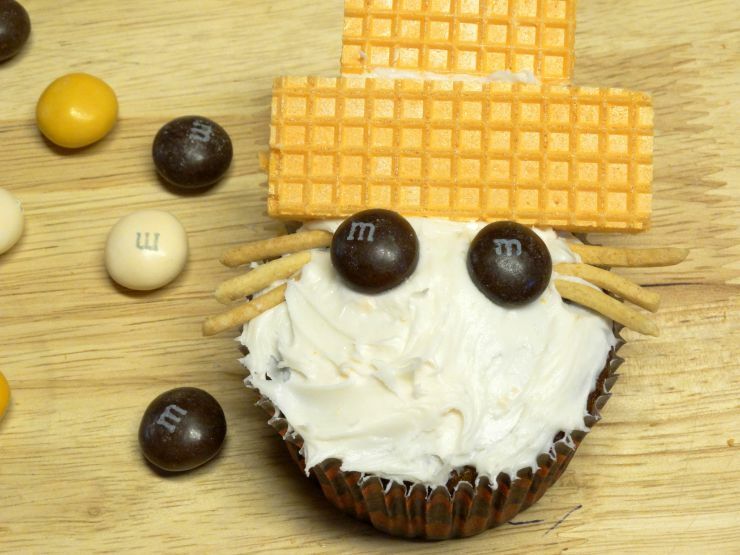 After finding the M&M’s® Pecan Pie at Walmart, I know I had to make an awesome recipe. And what says ‘Fall’ more than Carrot Cake cupcakes frosted with cream cheese icing? 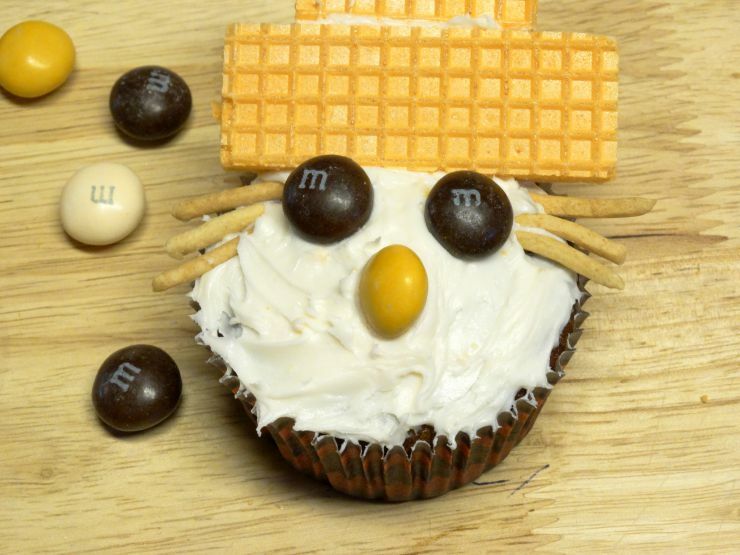 Carrot Cake Cupcakes frosted with cream cheese frosting and topped with M&M’s® Pecan Pie – that’s what! 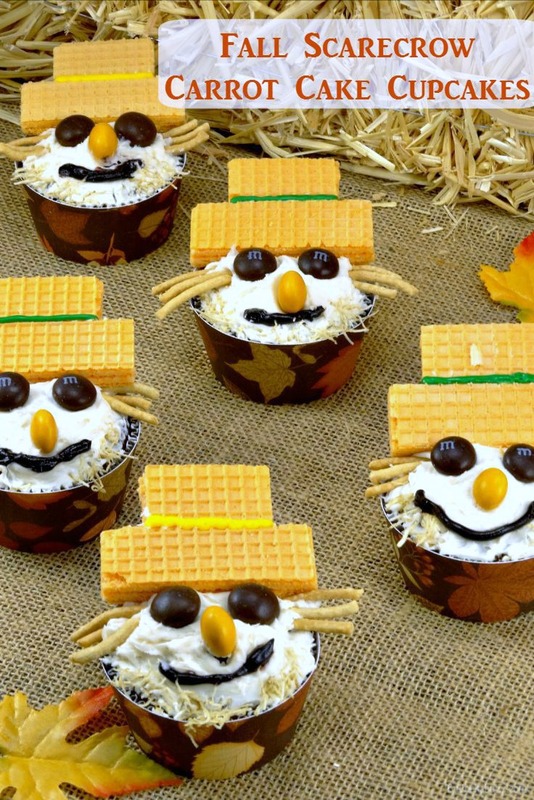 Of course being in the Fall type of mood, I just had to make those carrot cake cupcakes topped with cream cheese frosting into something Fall-ish, so after much thought I decided to make them into scarecrows and wrap them in some cute Fall-themed cupcake wrappers. The cupcakes came out so yummy, and looked so cute, that I just had to share (and I included a free printable so you can make your own Fall-themed cupcake wrappers, too)! 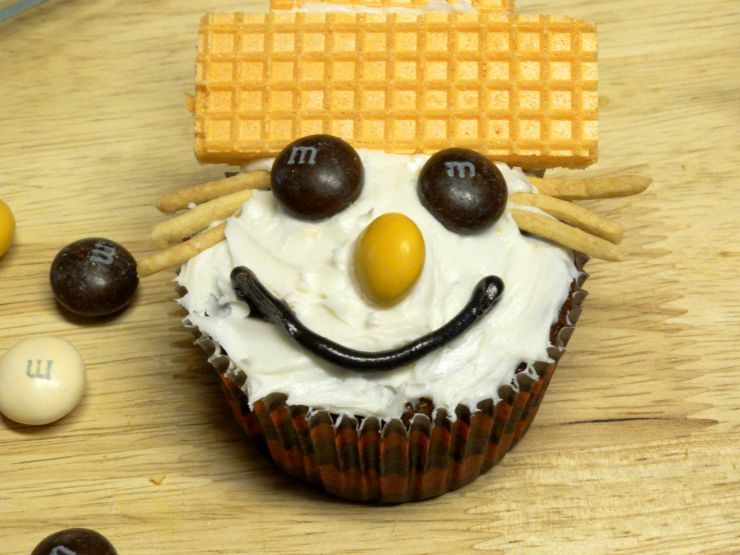 Ready to see how to make these adorable Fall Scarecrow Carrot Cake Cupcakes? Before you begin you’ll need to head to Walmart to get your ingredients. 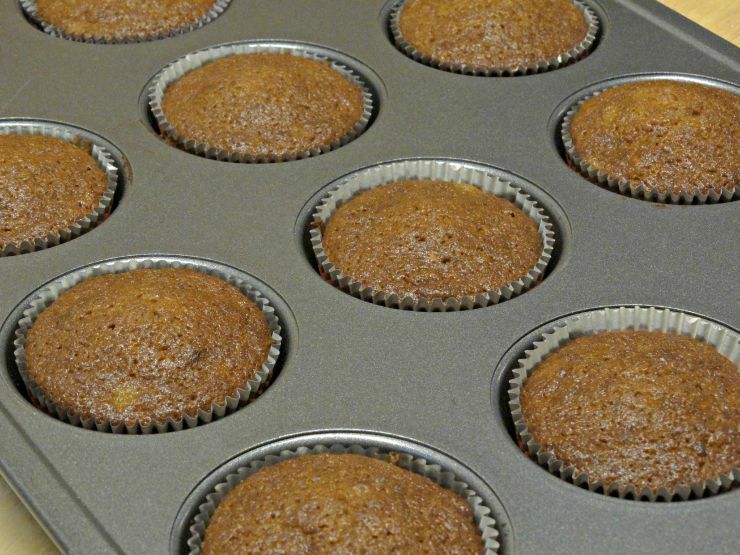 In order to make the cupcakes a bit healthier and less heavy, I picked up some Mott’s® Apple Sauce to use in place of multiple cups of vegetable oil. 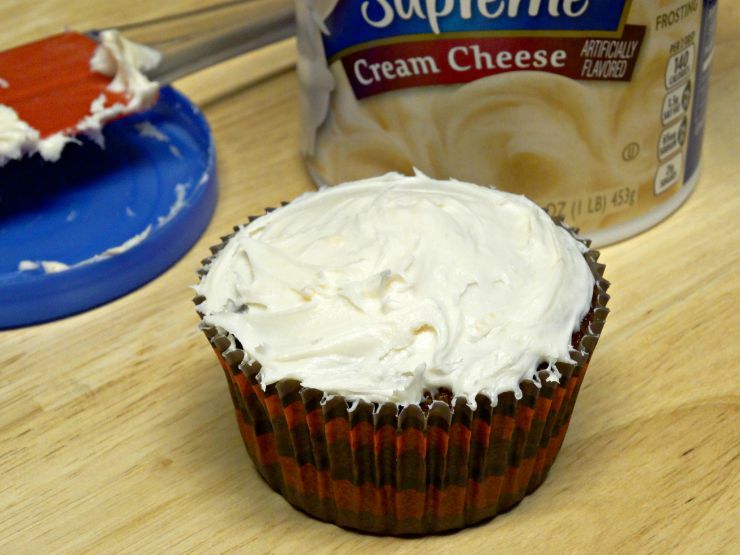 I also grabbed some Pillsbury™ Creamy Supreme® Cream Cheese Icing – so yummy on carrot cake cupcakes! And of course I couldn’t forget those tasty M&M’s® Pecan Pie! I found them on the seasonal aisle, although I’ve also seen them on an end cap. While I was there I also saw that they had Snapple® Apple in the 16 ounce single size and so I grabbed one of those too – it goes great with Carrot Cake Cupcakes! Preheat the oven to 400° F. *These are heavier cupcakes so they may not rise as much as regular cupcakes. In order to encourage rising, I like to start off baking the cupcakes at 400°F for about 8 minutes, then decrease the oven temp to 350°F and let finish baking. If you don’t want to do this, just preheat the oven – and bake the cupcakes at – 350°F. In a large bowl, beat together the eggs, oil, apple sauce, sugars, pineapple and teaspoon of vanilla. In a separate bowl combine the flour, baking soda, baking powder, salt, cinnamon, nutmeg and small pinch of ground cloves, and mix well. Next slowly add the dry mixture into the bowl with the wet ingredients, making sure to thoroughly combine all ingredients. 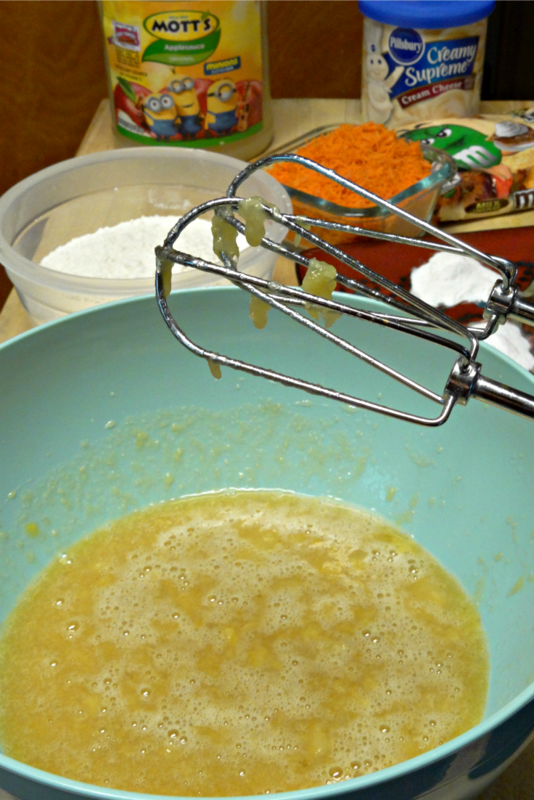 Now stir the shredded carrots into the batter. then place in the over to bake for 18-20 minutes or until a toothpick inserted in to middle of the cupcakes comes out clean. Once finished, remove from the oven and allow to cool completely before icing. 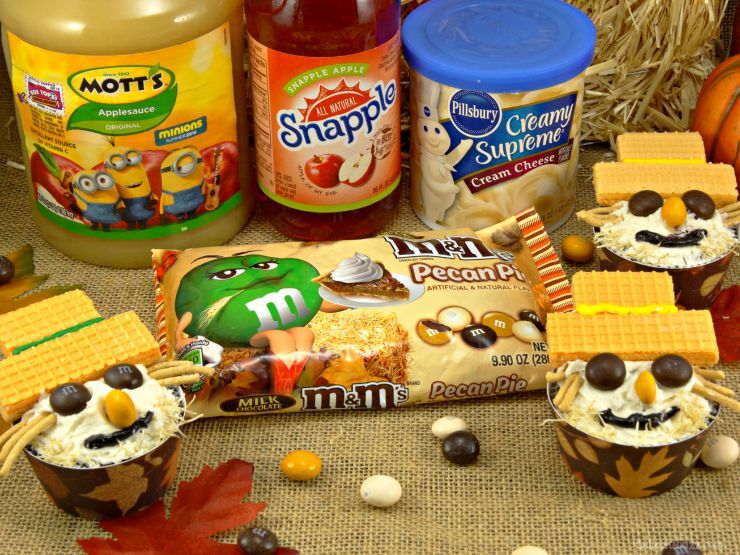 While the cupcakes are cooling, I like to gather the ingredients that I am going to use to decorate the cupcakes and put each one in its own bowl. This makes it easier to grab what you need and add it on to the cupcake. Once the cupcakes are completely cooled, frost each one with Pillsbury™ Creamy Supreme® Cream Cheese Icing using a knife or spatula. 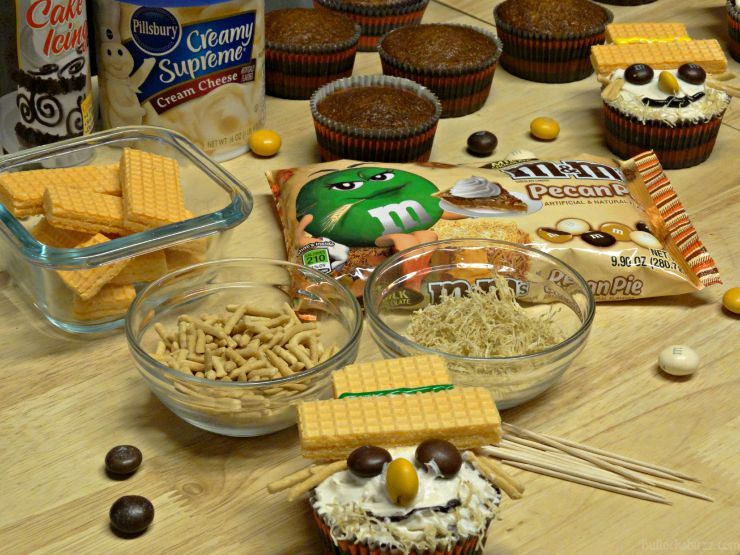 And now it’s time for the fun part – decorating the cupcakes! 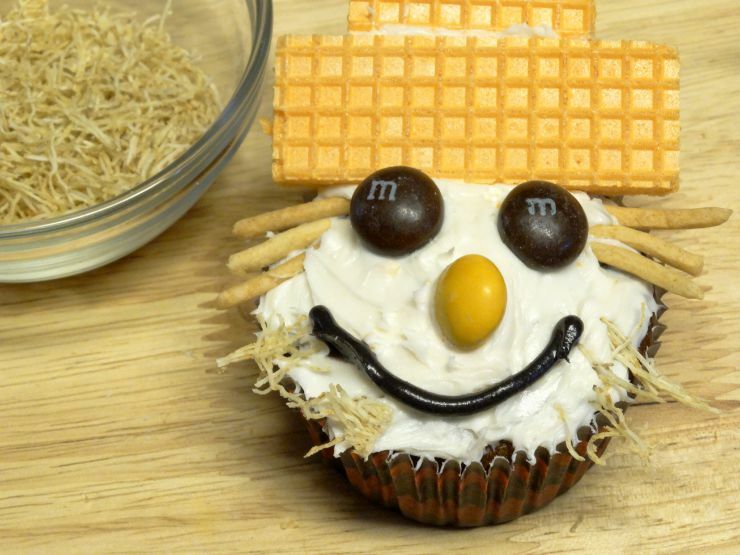 Kids will get a kick out of helping you turn these cupcakes into scarecrows for Fall and/or Halloween! 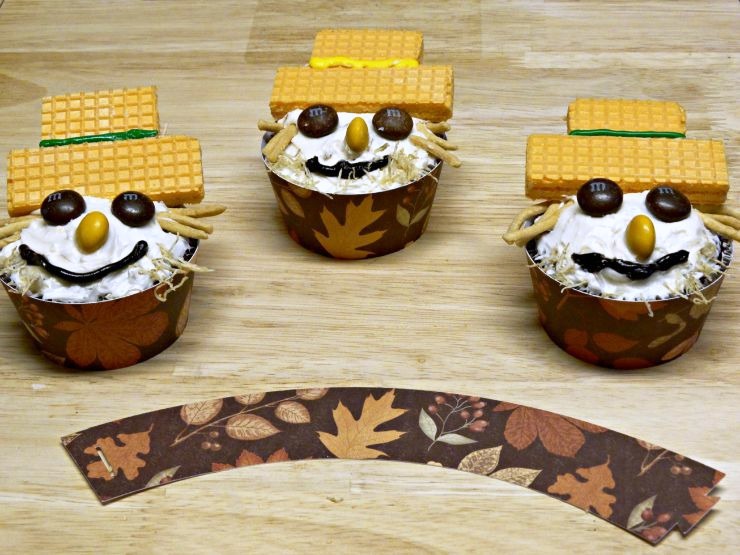 Begin by using the sugar wafer cookies for the hats, first cutting them down to size. 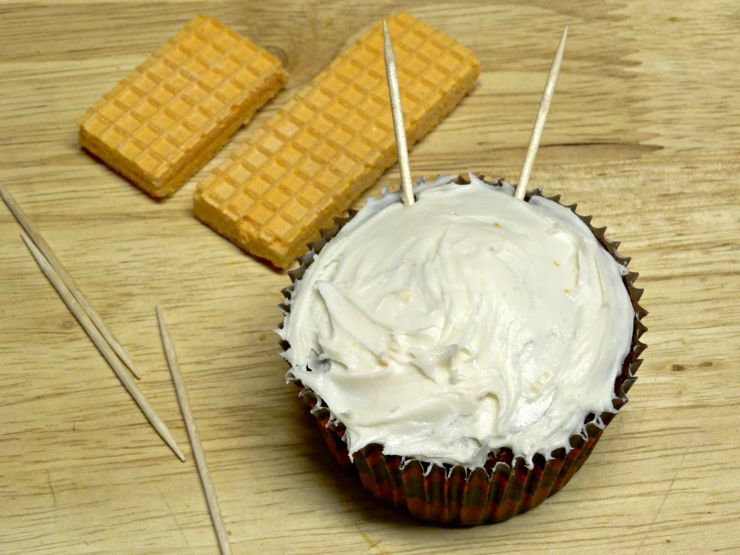 Now insert 2 toothpicks into the top back side of the cupcake. These will provide a bit more support for the hats. 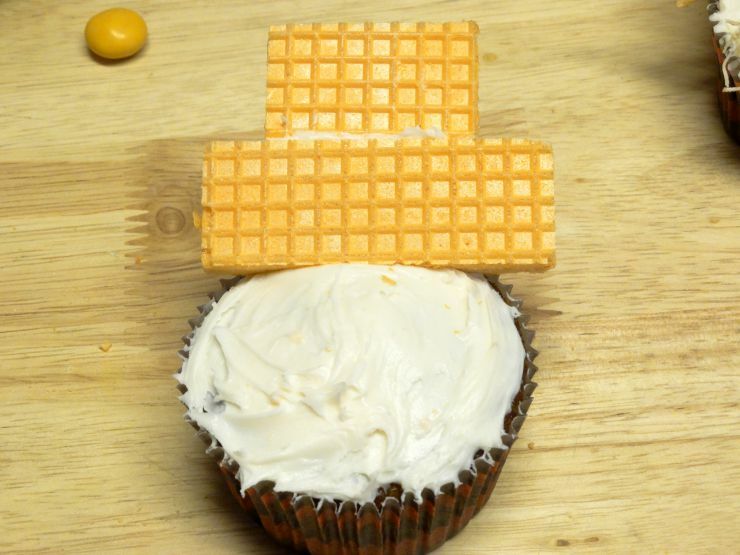 then place the finished hat on the cupcake. and a big grin made of black cookie icing. Now take a few pieces of the shredded wheat cereal and pull it apart into strands which will be used for the hay around the bottom of the scarecrow’s face. 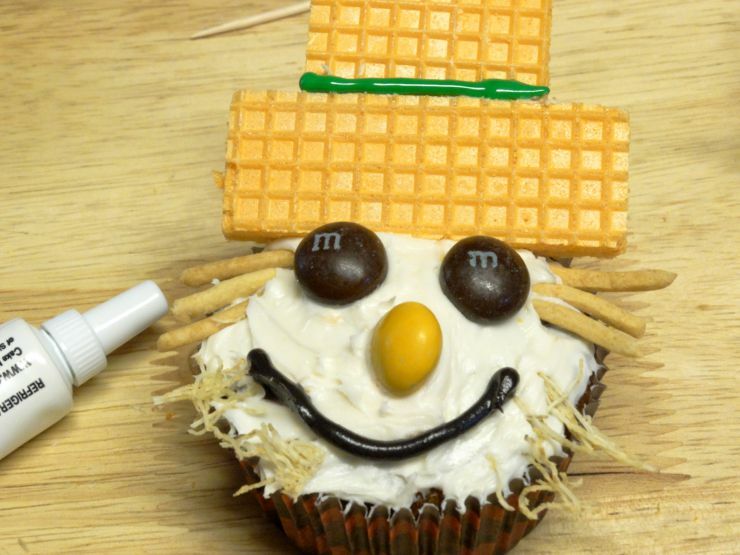 Then add some decoration to the scarecrow’s hat using the colored cookie icing, and there you have your adorable scarecrow cupcake! Once all of the cupcakes are decorated it’s time to add the cupcake wrappers. To do this simply print out the free cupcake wrapper pattern on a pretty piece of cardstock (or use it as a template to trace on your favorite fun Fall craft paper). 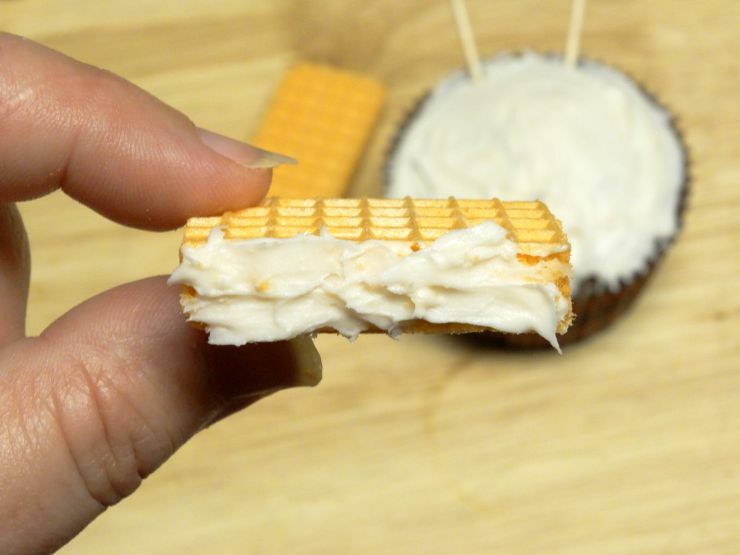 Cut out the cupcake wrapper so it resembles the one in the picture above, then either insert the tab into the slot (if you decide to cut out this part out too), or just use a dab of glue to connect it on the backside. Last, but not least, gently place the cupcakes down into the wrapper, and…that’s it – you’re done! 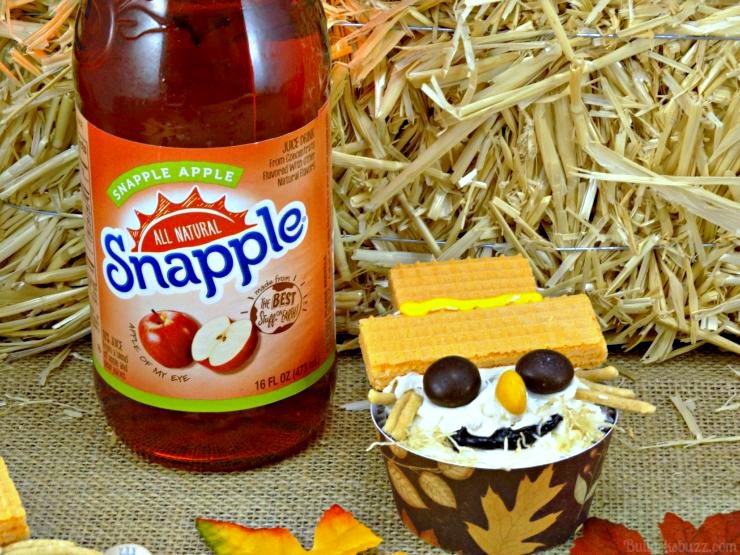 Now all that’s left to do is grab a cupcake along with a glass of Snapple® Apple, sit down and enjoy the sweet taste of Fall! Ready for that second piece of sweet news I told you about? If you enjoy baking as much as I do you are going to love this! Why not enter the MARS Bake In The Fun Sweepstakes, for your chance to win a Kitchenaid Mixer! You can enter using the widget below. 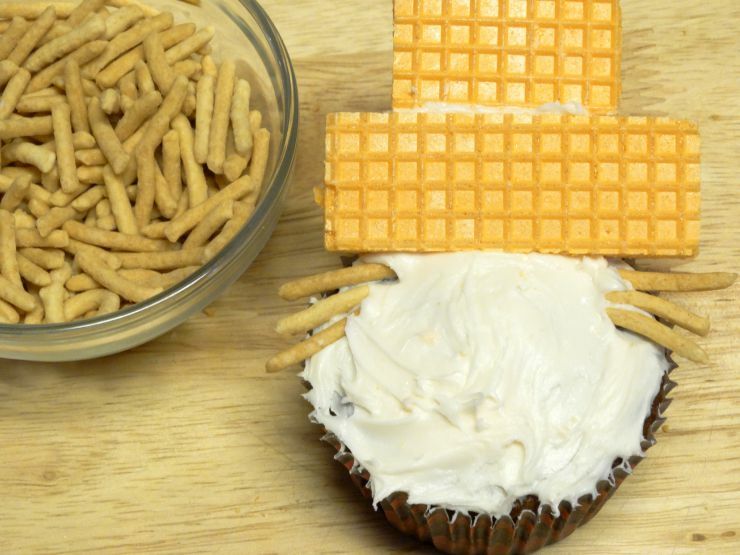 And don’t miss out on the handy printable for my Scarecrow Carrot Cake Cupcake recipe at the very bottom of this post! Want to find some more fantastic Fall recipes? You can find all sorts of great Autumn inspired dessert recipes here. 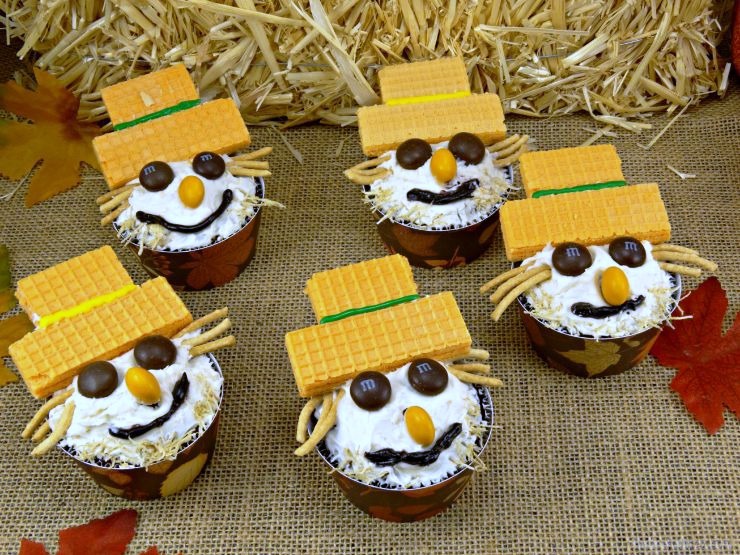 A delicious carrot cake cupcake recipe decorated to look like scarecrows. perfect for Fall and Halloween! In a separate large bowl combine the flour, baking soda, baking powder, salt, cinnamon, nutmeg and small pinch of ground cloves. Slowly add the dry mixture into the bowl with the wet ingredients, mixing well. 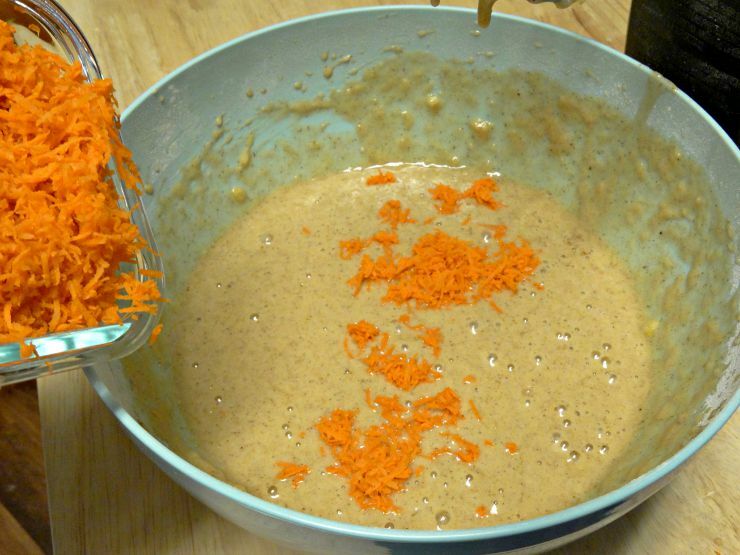 Stir the shredded carrots into the batter. Line a muffin tin with cupcake wrappers and fill each line about 3/4 full. 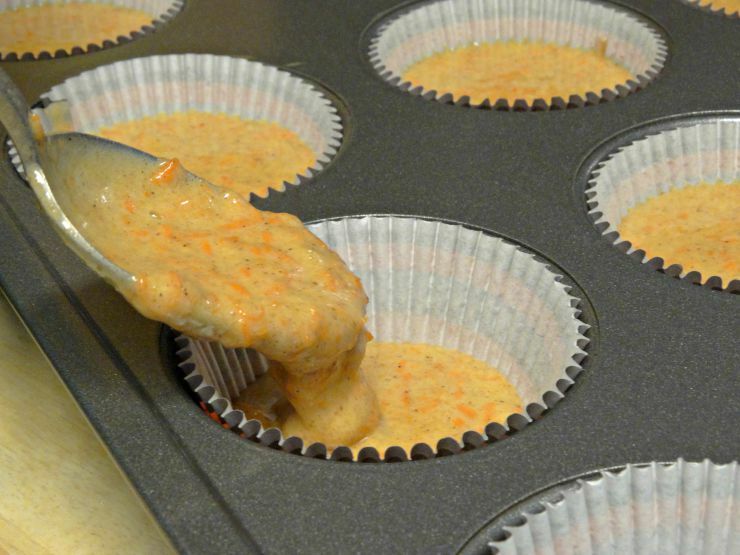 Place in the oven to bake for 18-20 minutes or until a toothpick inserted in to middle of the cupcakes comes out clean. Use the ingredients for decorating listed above to make your scarecrows.